Detecting, quantifying, and sizing indications characterized as a “crack” in critical equipment have long been the global benchmark of asset integrity programs. Therefore, the increased precision that inspection programs obtain using advanced technologies can dynamically improve the overall assessment. Cracks open to the surface have traditionally been inspected with conventional nondestructive testing methods like penetrant testing (PT) and magnetic testing (MT). As in many procedures, secondary methods may be used to verify, qualify, or quantify indications. A derivative method of MT, eddy current (EC) testing, is also widely used to detect cracks in various materials by using a similar flux leakage principle, and EC can provide increased precision to complement or replace other conventional methods by providing depth information, increased inspection speeds/productivity, minimal intrusion/waste, and digital recording. EC testing is not a new technology; it has been widely adopted to inspect for fatigue cracks in aluminum airplane skins and investigate damage mechanisms in heat exchanger tubes. Yet EC is still underutilized in the petroleum industry. This article presents a general overview of conventional methods (PT/MT), eddy current (EC) testing, and advancements in eddy current array (ECA) technology, which offers an increased potential for detection, characterization, and productivity over conventional inspection methods. The advantages of ECA as an additional nondestructive testing method for evaluating damage mechanisms, like stress corrosion cracking (SCC), is also highlighted. It is critical to understand the damage mechanisms that could potentially affect your equipment. Detection, characterization, and sizing of cracks play an important role in structural integrity assessments. 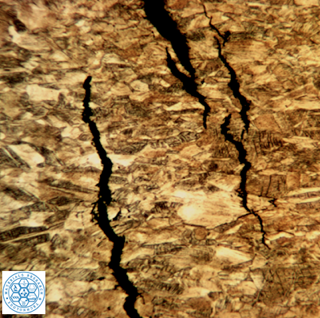 The inspection process used and the metallurgy are important variables that help inspectors assess the propensity for various damage mechanisms, such as environmentally-assisted cracks. Understanding the damage mechanism and its inherent characteristics (surface/subsurface, size, orientation, and location) plays an important role when selecting one inspection method over another. tensile stress (load or residual). These conditions are often found around welds, the heat affected zone (HAZ), and into the base material. In pressure vessels, process pipes, or storage tanks susceptible to SCC, the ability to detect cracks is one thing, but the ability to characterize the cracks and size their depth is critical. Narrow, branchlike (“spider web”) indications characteristic of SCC, combined with the potential for scale filling the crack void, can make detection challenging for conventional surface inspection methods. SCC has a high propagation rate that can lead to catastrophic results if undetected; therefore, detecting and properly identifying SCC is critical to deciding whether or not to take an asset out of service.